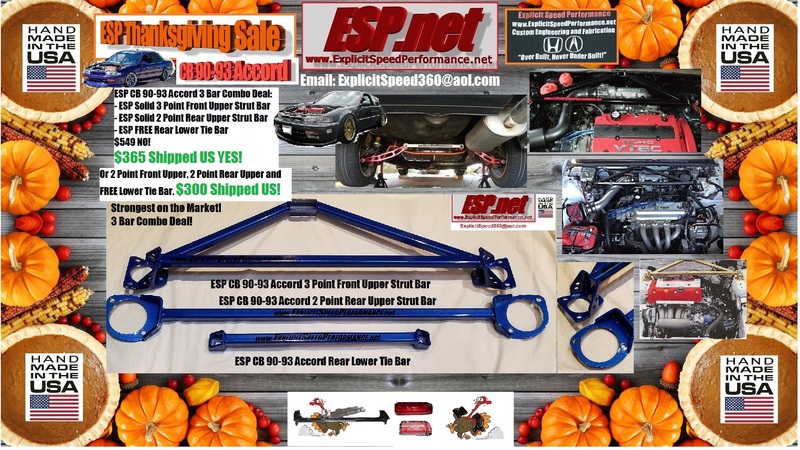 - ESP Thanksgiving Combo Deal Sale --- ESP Accord Traction Bar System with Front Torque Mount Kit F/H + CB 90-93 or CD 94-97 Accord Motor Mount Kit F/H and Rear T Bracket is only $40 additional!!! Huge Savings! NO SHIPPING COST! When Purchase both Mount Kit and Traction Bar System at SAME TIME! 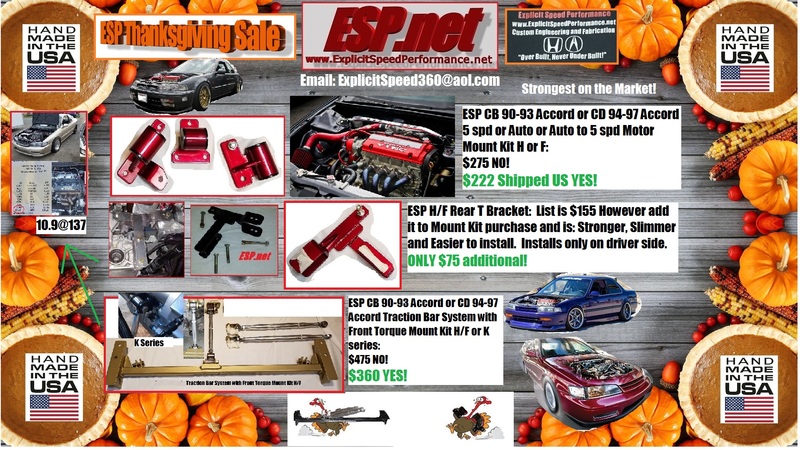 - ESP CB 90-93 Accord Auto or Auto to 5 spd or 5 spd Mount Kit ONLY $222 Shipped US. - ESP CD 94-97 Accord Auto or Auto to 5 spd or 5 spd Mount Kit ONLY $222 Shipped US. 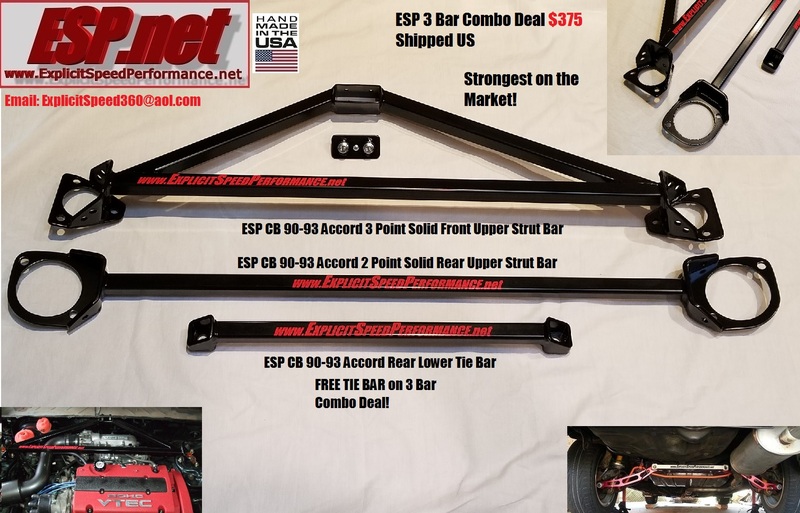 - Add our ESP Rear T Bracket H/F discounted from $155 Shipped US down to ONLYYYY $40 additional! Huge Savings! OR ASK!!! All products come standard semi gloss black powder coating with Red decal or choice of color decal. For a little additional we have 150 other powder coating colors to choose from. Many Candy Colors and Textured Colors. All Products are hand made and made upon purchase. They are not mass produced. Our products are the strongest on the market and best fitting. Rest-A-Sure when you purchase from us you will receive the best quality product available. Mount Kits come with Black 70A Polyurethane insert color. Mount Kits and Traction Bar Systems are 6-8 weeks and Strut Bars and Tie Bars are 8-10 weeks. However should be a little sooner. We are doing these on Personal time. There is absolutely NO Refunds Upon Purchase of Our Custom Pieces. Wait time is 8-10 weeks. May be a little sooner. We are doing them on personal time for past few years. These are very time consuming pieces. Each one is hand crafted from scratch. There is absolutely NO Refunds Upon Purchase of Our Custom Pieces. List is $459 Shipped US. Combo Deal Special Price $300 Shipped US! List is $549 Shipped US. Combo Deal Special Price $365 Shipped US!